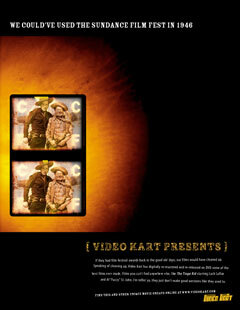 Ad for The Video Kart - a company that digitally restores rare films for release on DVD. The ad humorously plays upon how The Video Kart's movies *may* have won awards at film festivals, if film festivals existed in the '40s. Headline reads: "We could've used the Sundance Film Fest in 1946"